"Free to Be You and Me" redirects here. For the Supernatural episode, see Free to Be You and Me (Supernatural). 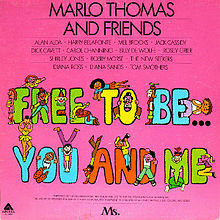 Free to Be… You and Me was a children's entertainment project, conceived, created and executive-produced by actress and author Marlo Thomas. Produced in collaboration with the Ms. Foundation for Women, it was a record album and illustrated book first released in November 1972 featuring songs and stories sung or told by celebrities of the day (credited as "Marlo Thomas and Friends") including Alan Alda, Rosey Grier, Cicely Tyson, Carol Channing, Michael Jackson, Roberta Flack, Shirley Jones, Jack Cassidy, and Diana Ross. An ABC special, also created by Marlo Thomas, using poetry, songs, and sketches followed two years later in March 1974. The basic concept was to encourage post-1960s gender neutrality, saluting values such as individuality, tolerance, and comfort with one's identity. A major thematic message is that anyone—whether a boy or a girl—can achieve anything. I told my sister Terre "it would take Dionne 30 years to get over it (stories featuring traditional gender roles) the same as it took all of us. We need to find her some different books to read" and she said "You go and find 'em." Well there weren't any. And not only weren't there any, I was in the bookstore one day looking around and found this one (picture book - I'm Glad I'm a Boy! I'm Glad I'm a Girl! by Whitney Darrow, Jr.) that showed a pilot on one page and a stewardess on a facing page (with a caption) that said "Boys are pilots, girls are stewardesses." Well I nearly had a heart attack right there in the bookstore. So I said "I'll make a record for Dionne. I'll ask everybody to donate their talents and it'll be fun." Larry Uttal at Bell Records told me, this kind of record might sell 15,000 copies tops. Well it went Gold right away, went Platinum within two years and went Diamond in under ten years. EVERYBODY was amazed it had touched such a nerve. It's still in the top 100 albums of all time over 40 years later. Produced by Carole Hart, with music produced by Stephen J. Lawrence and Bruce Hart, with stories and poems directed by Alan Alda, the title has never been out of print. Proceeds went to the Ms. Foundation for Women. The album was originally released on Bell Records in 1972 and since 1975 has been available on Arista Records cassettes and CDs. Well-known songs include "It's All Right to Cry," sung by football hero Rosey Grier; the title track by the New Seekers; "Helping," a Shel Silverstein poem performed by Tom Smothers; "Sisters and Brothers" by the Voices of East Harlem; and "When We Grow Up" performed by Diana Ross on the album and by Roberta Flack and a teenage Michael Jackson on the special. Other sketches, some of them animated in the television special, include "Atalanta," co-narrated by Thomas and Alda, a retelling of the ancient Greek legend of Atalanta; "Boy Meets Girl" with Thomas and Mel Brooks providing the voices for puppets, designed, performed and manipulated by Wayland Flowers, resembling human babies, who use cultural gender stereotypes to try to discover which is a boy and which a girl; "William's Doll", based on Charlotte Zolotow's picture book about a boy whose family resists his requests for a doll until his grandmother explains that William wishes to practice being a good father; and "Dudley Pippin" with Robert Morse and Billy De Wolfe, based on stories by Phil Ressner. A number of pieces from the record did not make the special, most for lack of time, although Housework was left off due to the somewhat condescending tone it lent to its' description of domestic workers. In among all the praise we got for the project as a whole, we kept getting all these letters and phone calls talking about the track sounding as if it wasn't normal to be fond of cooking and cleaning and caretaking etc. So we left that off the special for that reason. The children pictured on the original LP jacket were schoolmates of Abigail, Robin, and David Pogrebin, children of Letty Cottin Pogrebin, then editor of Ms. Most of the children attended Corlears School. "Marlo Thomas and Friends" followed Free to Be... You and Me with a 1988 sequel, Free to Be... a Family, the first primetime variety show created and produced in both the United States and the Soviet Union. In her 2010 memoir, Growing Up Laughing, Marlo Thomas reflected on the astonishing impact the Free to Be projects had on the culture. The show won an Emmy and a Peabody, the book became number one on the New York Times best-seller list and the record went gold. We were floored by the impact it all had. My little message for Dionne had gone straight to the hearts of moms and dads and aunties and uncles and, most of all, teachers, who embraced it as a way to teach the kids in their lives a new way of thinking about themselves. The television special, produced by Marlo Thomas and Free to Be Productions, in association with Teru Murakami-Fred Wolf Films, Inc. and cosponsored by the Ms. Foundation, first aired March 11, 1974, on ABC. It earned an 18.6 rating/27 share and went on to win an Emmy. Sixteen-mm prints of the special were also struck, and some schoolchildren from the 1970s and 1980s remember seeing the television special, or the filmstrip based on the special, in their school during that period. The special appeared occasionally on HBO in the 1980s. It was released on VHS through Vestron Video subsidiary Children's Video Library in 1983. It was also seen on the cable channel TV Land, yet has not been aired on any network since. A Region 1 DVD of the television special was released in November 2001, and in 2010, a newly remastered version was released featuring a number of new extras including a deleted scene showcasing Dustin Hoffman. Some material here is left out of the TV special and vice versa while other material appears only in the accompanying hardcover book. "When We Grow Up" – Music by Stephen J. Lawrence, Lyrics by Shelly Miller, Performed by Roberta Flack and Michael Jackson on the special and Diana Ross on the Original Cast CD. In March 2014, The Paley Center for Media hosted an event commemorating the 40th anniversary of Free to Be, co-moderated by Marlo Thomas and Gloria Steinem, which included many of the participants in the original project. To commemorate the 40th anniversary of the original project, a book called When We Were Free to Be: Looking Back at a Children's Classic and the Difference It Made was published. Free to Be faced backlash from some conservative religious leaders, including Evangelical author and psychologist James Dobson. Kyle Smith from the New York Post claimed the project emasculated men. The Daily Beast issued a rebuttal. ^ Martin, Rachel (7 December 2012). "40 Years On, 'Free To Be' Still Resonates" (Audio interview). Morning Edition. NPR. Retrieved 19 October 2014. ^ Thomas, Marlo. "Birth of 'Free to Be... You and Me'" (Video interview). Makers. Retrieved 19 October 2014. ^ "The Paley Center Celebrates: Free to Be…You and Me at 40" (Video - moderated panel). The Paley Center for Media. 11 March 2014. Retrieved 19 October 2014. ^ Kois, Dan (23 October 2012). "Free To Be: Forty years ago, a bunch of feminists made an album. They wanted to change ... everything". Slate. Retrieved 19 October 2014. ^ Thomas, Marlo (30 January 2013). "Free to Be... You and Me -- Forty Years Later". The Huffington Post. Retrieved 19 October 2014. ^ Gumbrecht, Jamie (11 March 2014). "Remembering 'Free to Be... You and Me,' 40 years later". CNN. Retrieved 19 October 2014. ^ Rotskoff, Lori; Lovett, Laura (2012). When We Were Free to Be: Looking Back at a Children’s Classic and the Difference It Made. Chapel Hill, NC: University of North Carolina Press. ISBN 978-1-4696-1905-7. ^ Smith, Kyle (8 March 2014). "How 'Free to Be … You and Me' emasculated men". New York Post. Retrieved 19 October 2014. ^ Shire, Emily (11 March 2014). "'Free to Be…You and Me' Did Not Emasculate Men". The Daily Beast. Retrieved 19 October 2014. "Happily Ever After: Free to Be … You and Me, Second-Wave Feminism, and 1970s American Children’s Culture." by Leslie Paris. pp. 519–538. This page was last edited on 22 October 2018, at 22:29 (UTC).